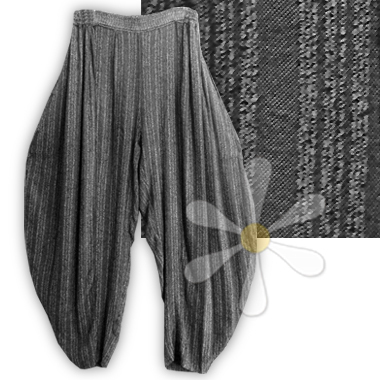 MOROCCAN SUSTI HAREM PANTS IN WOVEN TEXTURED STRIPES! When these arrived our jaws dropped... trust us, we will be relentless in hunting down more of this magnificent djellaba fabric from the four corners of the planet! For now, there's just this one pair -- well, this and the near-matching MEDINAH top offered separately -- and it's in our best-selling harem style! We call these the Marrakech, Tienda Ho unceremoniously refers to them as 'BJ3' -- we think you'll call them your favorite pair of pants! For measurements and details see our main MARRAKECH page.